Because the Pacific Ocean Area covered principally the ocean areas already under command of Admiral Chester W. Nimitz, Commander in Chief of the U.S. Pacific Fleet, it became obvious that Nimitz would be its commander. Nor was the identity of the Supreme Commander of the Southwest Pacific Area to be long in doubt; he was already preparing to leave for Australia. A joint press release was issued on 17 March at Melbourne and Washington, announcing that General MacArthur had arrived in Australia and would be Supreme Commander of the forces there and in the Philippines. To forestall Axis propaganda which might make capital of General MacArthur's departure from the Philippines, the release at Washington contained the additional statement (later cleared with the Australians) that his arrival had been "in accordance with the request of the Australian Government. "23 A great feeling of relief swept the Australian people when they learned that General MacArthur had arrived to take charge of their country's defense. The Australians had good cause to be enthusiastic over MacArthur's coming. One of the most renowned soldiers of his time, a divisional commander in World War I, a former Chief of Staff of the United States Army, a field marshal in the Philippine Army, and, as Commanding General of the United States Army Forces in the Far East, the leader of the heroic defense of the Philippines, MacArthur had shown himself to be possessed of exceptional gifts as a commander. There was every reason to believe that Australia's defense would be safe in his hands. GENERAL MACARTHUR ARRIVING IN SYDNEY is met by the Austrailian Prime Minister, Mr. Curtin. The Southwest Pacific Area, as set forth in the directive to General MacArthur, included Australia, the Philippines, New Guinea, the Bismarck Archipelago, the Solomons, and, except for Sumatra, the Netherlands Indies. As Supreme Commander, General MacArthur was to hold Australia as a base for future offensive action against Japan; sustain the U.S. position in the Philippines; support the operations of friendly forces in the Pacific Ocean Area and Indian Ocean; and "prepare to take the initiative. "32 The Pacific Ocean Area, Admiral Nimitz's command, was to be divided into three component parts: the Central Pacific, North Pacific, and South Pacific Areas. The first two would be under Admiral Nimitz's direct command; the third, the South Pacific Area, the area immediately adjoining the Southwest Pacific,33 would be under a naval officer of flag rank, who would be appointed by Nimitz and operate under his direction. By agreement among the Governments of Australia, the United Kingdom, the Netherlands and the United States there has been constituted, effective 1400 GMT, 18 April, 1942, the Southwest Pacific area, with boundaries as defined in annex 1. By virtue of the same authority, the undersigned hereby assumes command. The following commands are hereby created with commanders as indicated, composed of forces assigned to the Southwest Pacific Area by the respective Governments, and assigned to specific commands by this headquarters, initially as provided in Annex 1. Allied Land Forces, Southwest Pacific Area. Commander: General Sir THOMAS BLAMEY, K.C.B., C.M.G., D.S.O., Australian Army. Allied Air Forces, Southwest Pacific Area. Commander: Lieutenant General GEORGE H. BRETT, United States Army. Allied Naval Forces, Southwest Pacific Area. Commander: Vice Admiral HERBERT F. LEARY, United States Navy. United States Forces in the Philippines. Commander: Lieutenant General JONATHAN WAINWRIGHT, United States Army. United States Army Forces in Australia. Commander: Major General JULIAN F. BARNES, United States Army. General Chamberlin, Colonel Whitlock, and Colonel Fitch had served on the staff of USAFIA, and the other members of the staff had come out of the Philippines with General MacArthur and served on his staff there. All the heads of staff sections were Americans; such Dutch and Australian officers as were assigned to General Headquarters Southwest Pacific Area served under them as members of the staff sections. that it would require a minimum of 25 divisions [to hold Australia] against the scale of attack which is possible." "This would mean," they added, "that 10 fully equipped divisions would have to be supplied by our Allies"44--an impossible figure, as they well knew, since neither the British nor the United States between them were in any position at the time to supply them with that many ground troops. In March 1943, a year after his arrival, General MacArthur publicly revealed that he had no sooner reached Australia than he concluded that the key to its defense lay not on the mainland but in New Guinea. Although his available means were extremely meager,45 he assumed as a matter of course that he would be given sufficient naval and air support to ensure a successful defense of the continent at its approaches,46 an assumption that the Australian Chiefs were then in no position to make, especially after what had happened to their ground forces in Malaya, Amboina, and Timor. MacArthur's position, as he explained it a year after the event, was essentially that it was too much to expect that naval and air support on a scale sufficient to defend the vast reaches of the continent successfully either would or could be made available. He told Mr. Curtin (who understood it to be the main point of difference between him and "our Chiefs of Staff earlier appreciations") that even twenty-five divisions would probably be insufficient to hold the mainland without such support.47 He was reasonably sure, however, that it could be held with such forces as were likely to be made available if the main defensive effort was made not in Australia itself but in New Guinea. The strategic principle as he conceived it at the time, and as he stated it later on, was that the successful defense of Australia required that the battle "be waged on outer perimeter territories rather than within the territory to be defended. "48 The fight for Australia, in short, would be waged not on the mainland but in New Guinea. As events turned out, both the defense and the offense--when offense became possible--were pivoted on Port Moresby. On 4 April, the Australian Chiefs of Staff, in conjunction with General MacArthur's headquarters, prepared a joint estimate of the situation. The estimate noted that the enemy had virtually undisputed control of both sea and air in the South and Southwest Pacific and could be expected to undertake an offensive in great strength "against Australia's supply line and against Australia itself," in the very near future. The one part of Australia "essential to the prosecution of the war," the estimate continued, was on the southeast and east coasts in the general area between Melbourne and Brisbane. The "critical point" which controlled this area was Port Moresby, against which a major offensive could be expected almost any time, for the enemy was known to be massing heavy forces at Rabaul for a possible thrust against it. Darwin and Fremantle, isolated points on the north and southwest coasts far from the vital centers of the country, were also open to attack, but their defense presented no great problem if they were to be suitably reinforced, for their position was such that they could be held as outposts. The real danger was at Port Moresby. If Port Moresby fell to the Japanese, its loss would put in immediate jeopardy the safety of Australia's "all important area"--the Brisbane-Melbourne coastal belt. The reinforcement of Port Moresby was no easy matter. Its supply line from Australia across the Gulf of Papua was exposed to enemy action. Its port facilities were inadequate; its two existing airfields were small and poorly built; and, except for one field at Horn Island in Torres Strait, there were no intermediate air bases between it and the concentration area in the Townsville-Cloncurry region, 700 miles away. A good beginning had been made in the defense of Australia and its advance base, Port Moresby, but it was only a beginning. General MacArthur, who had counted on greater support than he was receiving, felt very strongly that the allotted means were insufficient for the task in hand and began at once to press for additional forces. Taken to task in the matter by General Marshall the next day, MacArthur, who had just sent Marshall a message complaining about the general inadequacy of his forces,67 replied on 3 May that he should not be held responsible for the use to which Mr. Curtin had put his remarks. He had made them, he said, at Mr. Curtin's request, and purely as he thought for the Australian's personal information. His position was, MacArthur pointed out, a delicate one. Mr. Curtin expected him to advise the Australian Government on all matters relating to Australia's defense, and if he was to continue as Supreme Commander, and hold the confidence of the Australian Government, he had no choice but to do so. The preoccupation of the Australian Government with the security of its country was well known. The difficulty was that the Australians, both in government and out, were fearful that insufficient forces had been allotted to the defense of their country, a view in which he in his professional military capacity could not help but concur.68 The issue was joined; the next move was General Marshall's. The President went further and, in a personal message to General MacArthur, explained why it had been decided not to increase the existing allocation in his area. He wrote that he found it difficult to get away from the fact that the armies of the USSR were, at that time, "killing more Axis personnel and destroying more Axis matériel than all the other twenty-five United Nations put together." It seemed logical therefore to try to support the Russian effort "in every way that we possibly can, and also to develop plans aimed at diverting German land and air forces from the Russian front." 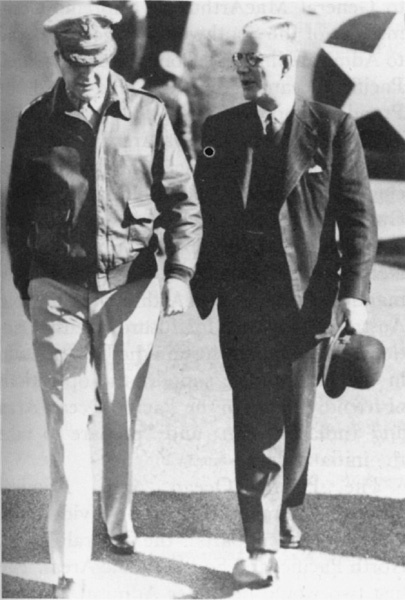 MacArthur was assured that despite this emphasis on European operations, his needs would not be lost sight of, and he was promised all the air strength that could possibly be spared. Four days later, General Marshall wrote to Sir John again. Noting that Australian ground strength in Australia would total 400,000 men by June, he told Dill that, with the shipping situation what it was, there seemed to be little justification for the dispatch of additional U.S. ground forces to Australia. Ground and air forces projected for Australia, General Marshall continued, were believed to be sufficient for such operations as were immediately visualized for the area, especially since full-scale invasion of Australia did not appear to be imminent and the British had obligated themselves to send both troops and naval forces from the Indian Ocean if it was. The matter was settled. If the primary effort in Europe was not to be hamstrung, General MacArthur would have to make the best shift he could with what he had. 1. Memo, WPD for TAG, 8 Jan 42, sub: Personnel and Supply Policy in Australia, in WPD 4630-28; Memo, WPD for ACofS G-3 WDGS, 17 Feb 42 sub: Movement of Troops to SUMAC, in WPD 4630-66. 2. Memo, WPD for ACofS G-3 WDGS, 17 Feb 42, sub: Movement of Troops to SUMAC; Msg, Gen Marshall to Gen Brett, No. 479, 1 Mar 42, in AG 381, Sec. 2c. 3. Msg, Gen Brett to TAG, No. 27, CM-IN 833, 17 Feb 42; Msg, Mr. Curtin to Mr. Churchill, 21 Feb 42, in OPD Exec Off File, Bk 4; General Staff, India, ABDACOM: An Official Account of Events in the Southwest Pacific Command, January-February 1942 (New Delhi, 1942), pp. 71-72, 83; Churchill, The Hinge of Fate, pp. 155-59. 4. Msg, Curtin to Churchill, 23 Feb 42, quoted in Churchill, The Hinge of Fate, pp. 163-64. 5. Msg, Curtin to Churchill, 21 Feb 42. 6. Ltr, Mr. Churchill to Mr. Roosevelt, No. 37, 4 Mar 42, in CCS 56, ABC 311.5 (1-30-42), CPS 7th Mtg, 6 Mar 42, in CCS 56/1; Msg, Gen Marshall to CG USAFFE, No. 739, 18 Mar 42, in SWPA-MacArthur File, OPD Exec File; Long, Australia in the Second World War, p. 396; Churchill, The Hinge of Fate, pp. 163-66, 173, 174. 7. Memo, Lt Col Henry I. Hodes for Brig Gen Robert W. Crawford, 17 Apr 42, in OPD 400 Australia. 8. Ibid. ; Msg, Gen Marshall to Gen Brett, No. 626, 10 Mar 42, in WPD 381 Aust (3-8-42). 9. Msg, Gen Marshall to Gen Brett, No. 479, 1 Mar 42; Msgs, Gen Brett to Gen Marshall, No. 490, CM-IN 48, 4 Mar 42, No. 505, CM-IN 99, 5 Mar 42. The original allotment had been four, not three, pursuit groups, but an undertaking by the United States to maintain one Australian pursuit group at full strength had cut down U.S. pursuit strength by one group. 10. Msg, Gen Marshall to CG USAFFE, No. 1024, 8 Feb 42; Msg, Gen Marshall to Gen Brett, No. 351, 18 Feb 42. Both in AG 381, Sec. 2c. 11. Memo, Admiral Ernest J. King for the President, 5 Mar 42 in OPD Exec Off File, Bk 4. 12. Msg, Roosevelt to Churchill, No. 115, 9 Mar 42, in CCS 56/1 ABC 311.5 (1-30-42). The full proposal was that there be three theaters: the Pacific Theater, the Indian Ocean-Middle East Theater, and the European-Atlantic Theater. The Pacific Theater as a responsibility of the United States would be under the Joint Chiefs of Staff, the Indian Ocean-Middle East Theater would be under the British Chiefs of Staff; and the European-Atlantic Theater would be a joint responsibility. 13. Appreciation by the Australian and New Zealand Chiefs of Staff, 26 Feb 42, sub: Future Policy and Strategy for Conduct of War in the Pacific-Australia and New Zealand, in 314.7 MacArthur File, Rec Sec Files, GHQ SWPA; Msgs, Gen Brett to Gen Marshall, No. 81, 27 Feb 42, in OPD Exec Off File, Bk 4, No. 390, CM-IN 1458, 28 Feb 42, No. 467, CM-IN 30, 3 Mar 42; Msg, British Chiefs of Staff to Joint Staff Mission, No. W-109, 7 Mar 42, in CCS 57, ABC 323.31, POA (1-29-42), Sec. 1a. 14. JCS 5th Mtg, Item No. 1, 9 Mar 42, sub: Governmental and Strategical Control and Commands in the ANZAC Area-Demarcation of New Strategic Areas in the Japanese War Zone. 15. Memo, Admiral King for the President, 5 Apr 42, in CCS 57/2, ABC 323.31, POA (1-29-42) Sec. 2. 16. JCS 18, Governmental and Strategical Control and Command in the ANZAC Area, 8 Mar 42, in ABC 323.31, POA (1-22-42), Sec. 1a; JCS 18/2 Creation of Southwest Pacific Area, 9 Mar 42, in ABC 323.31, POA (1-29-42), Sec. 2; JCS 5th Mtg, 9 Mar 42. In addition to the Southwest Pacific Area and the Pacific Ocean Area, the Pacific Theater included the Southeast Pacific Area--a broad band of ocean facing the western coasts of Central and South America, well outside the combat zone. 17. Memo, WPD for Officer in Charge, Code Room, 4 Feb 42, WDCSA 370.05 Philippines (317-42), in DRB HRS, AGO. 18. Msg, Gen Marshall to Gen MacArthur, No. 1678, 22 Feb 42, WDCSA 370.05 Philippines (317-42). 19. Msg, Gen MacArthur to Gen Brett, No. 58, 13 Mar 42; Msg, Gen MacArthur to Gen Marshall, No. 482, 14 Mar 42; Msgs, Gen Brett to Gen MacArthur, No. CG 1179, 14 Mar 42, No. 79, 15 Mar 42; Msg, Gen Brett to Gen Marshall, No. 736, 17 Mar 42. All in 384-1, MacArthur File, G-3 Files, GHQ SWPA. Lt. Gen. George H. Brett, "The MacArthur I Knew," Time, October 1947, p. 140. 20. Msg, Gen Marshall to Gen Brett, No. 613, 10 Mar 42, in 384-1, MacArthur File, G-3 Files, GHQ SWPA. 21. Tel Msg, Gen Brett to Mr. Curtin, 17 Mar 42, in 384-1, MacArthur File, G-3 Files, GHQ SWPA. The message, which had been prepared in advance, was read over the phone to Mr. Curtin at 1615 that day, and a confirmation was sent by mail later the same day. 22. Msg, President Roosevelt to Former Naval Person, 17 Mar 42, in Item No. 10, Exec No. 10, Col Gailey's File, OPD Exec File; Msg, Gen Brett to Gen Marshall, No. 736, 17 Mar 42, in 384-1 MacArthur File, G-3 Files, GHQ SWPA. 23. WPD Press Release, 17 Mar 42, copy in OCMH files; Msg, President Roosevelt to Former Naval Person, 17 Mar 42; Msg, Gen Marshall to Gen Brett, No. 716, 17 Mar 42. Both in Item No. 10, Exec No. 10, Col Gailey's File, OPD Exec File. 24. Msg, Gen Marshall to Gen MacArthur, Melbourne, No. 79, 18 Mar 42, copy in OPD Exec Off File, Bk 4. 25. Ltr, Mr. Curtin to Gcn Brett, 17 Mar 42, in 314.7 MacArthur File, Rec Sec Files, GHQ SWPA. Msg, Gen Brett to Gen Marshall, No. 792, 21 Mar 42; Msg, Gen Marshall to Gen MacArthur, No. 3, 21 Mar 42. Both in SWPA-MacArthur File, OPD Exec File. 26. Msg, Gen MacArthur to Gen Marshall, No. 3, 21 Mar 42; Msg, Gen Marshall to Gen MacArthur, No. 810, 22 Mar 42. Both in SWPA-MacArthur File, OPD Exec File. 27. Msg, Gen MacArthur to Gen Marshall No. 19, 24 Mar 42, copy in SWPA-MacArthur File, OPD Exec file. 28. Msg, Gen MacArthur to Gen Marshall, No. 56, CM-IN 0013, 1 Apr 42. 29. Msg, Prime Minister Churchill to President Roosevelt, No. 46, 18 Mar 42, in JCS 19/1, ABC 271 (3-5-42). 30. CCS 57/2, Strategic Responsibility of the U.K. and the U.S., 24 Mar 42, in ABC 323.31, POA (1-29-42), Sec. 2. 31. JCS Directive to the Supreme Commander in the Southwest Pacific Area, 30 Mar 42; JCS Directive to the CinC Pacific Ocean Area, 30 Mar 42. Both in CCS 57/1. Memo, Brig Gen W. B. Smith, U.S. Secy CCS, for Gen Marshall and Admiral King, 1 Apr 42, in ABC 323.31, POA (1-29-42), Sec. 2. 32. JCS Directive to the Supreme Commander, Southwest Pacific Area, 30 Mar 42. 33. It should be noted that the South Pacific Area included everything south of the equator between 160° east longitude and 110° west longitude, except for the Solomon Islands, which were then in the Southwest Pacific Area, and Canton Island, which was in the Central Pacific Area. Fiji, Samoa, New Caledonia, and New Zealand were thus in the South Pacific Area, as were the New Hebrides and the Santa Cruz Islands. 34. JCS Directive to the CinC Pacific Ocean Area, 30 Mar 42. 35. Msg, Mr. Curtin to Dr. H. V. Evatt, No. 31, 7 Apr 42; Ltr, Admiral King to Dr. Evatt, 10 Apr 42; Ltr, Dr. Evatt to Admiral King, 14 Apr 42. All in ABC 323.31 POA (1-29-42), Sec. 2. Msg, Gen Marshall to Gen MacArthur, 14 Apr 42, in SWPA MacArthur File, OPD Exec File. 36. GHQ SWPA GO No. 1, 18 Apr 42. 37. Ltr, Mr. Curtin, to Gen MacArthur, 17 Apr 42, in G-3 Jnl, GHQ SWPA. 38. Ltr, Gen MacArthur to Mr. F. G. Shedden, Minister for Defence Coordination, Commonwealth of Australia, 13 Apr 42, copy in 314.7, MacArthur File, Rec Sec Files, GHQ SWPA. 39. GHQ SWPA GO No. 1, 18 Apr 42; Msgs, Gen MacArthur to Gen Marshall, No. AG 381, CM-IN 5422, 20 Apr 42, No. AG 415, 20 Apr 42, copy in SWPA-MacArthur File, OPD Exec File, No. AG 441, CM-IN 2601, 25 Apr 42; Allied Air Forces CGO No. 2, 27 Apr 42. 40. Msg, Gen Marshall to Gcn MacArthur, No.1178, CM-OUT 1495, 9 Apr 42. 41. GHQ SWPA GO No. 2, 19 Apr 42. 42. Msg, Gen MacArthur to Gen Marshall, No. AG 994, CM-IN 4634, 15 Jun 42. 43. Appreciation by the [Australian] Chiefs of Staff--February 1942, 27 Feb 42, in G-3 Jnl, GHQ SWPA. 45. The order of arrival from the Middle East of AIF brigades at Fremantle was as follows: the 25th on 4 March, the 21st on 15 March, the 18th on 20 March (these three units comprising the 7th Australian Infantry Division); and the 19th Brigade of the 6th Australian Infantry Division on 20 March. United States troops in Australia numbered less than 25,000--about half of them air force personnel and the rest field artillery, antiaircraft, and service troops. The Air Corps had planes enough only for one heavy bombardment squadron, one light bombardment squadron, and six pursuit squadrons. Admiral Leary's command consisted of a few cruisers and destroyers, and the squadron of B-17's assigned to him for operations against Rabaul. Msgs, Gen Brett to Gen Marshall, No. 510, CM-IN 115, 8 Mar 42, n. n., CM-IN 108, 12 Mar 42, No. 727, CM-IN 59, 17 Mar 42; CPS 9th Mtg, 9 Mar 42, sub: Defense of Australia, in ABC 381 Australia (11-23-42); Msg, COMINCH to COMANZACFOR, 11 Mar 42, in OPD Exec Off File, Bk 4; Craven and Cate, The Army Air Forces in World War II, I, 411. 46. Ltr, Mr. Curtin to Gen MacArthur, 8 May 42, in 314.7 MacArthur File, Rec Sec Files, GHQ SWPA; Frazier Hunt, MacArthur and the War Against Japan (New York, 1944), pp. 82, 83. 47. Ltr, Mr. Curtin to Gen MacArthur, 16 May 42, in 314.7 MacArthur File, Rec Sec Files, GHQ SWPA. In this letter, Mr. Curtin summaries for General MacArthur and the record his understanding of a previous conversation with MacArthur. 48. Ltr, Gen MacArthur to Mr. Curtin, 6 Oct 42, in 314.7, MacArthur File, Rec Sec Files, GHQ SWPA. See also Hunt, MacArthur and the War Against Japan, pp. 82, 83. 49. Ltr, Gen MacArthur to Mr. Curtin, 6 Nov 43 in 314.7, MacArthur File, Rec Sec Files, GHQ SWPA; Ltr, Mr. Curtin to Gen Blamey, 16 Nov 43; Ltr, Gen Blamey to Mr. Curtin, 28 Jan 44. Copies of both in OCMH files. 50. Msg, Gen MacArthur to Gen Marshall, No. 70, CM-IN 1069, 4 Apr 42. 51. Prov Opns Rpt, Australian Army, 3 Apr 42, in G-3 Jnl, GHQ SWPA; Msg, Gen Marshall to Gen Brett, No. 1167, 7 Apr 42, copy in OPD 320.2, Australia; Barnes Rpt. 52. Allied Air Forces Opns Rpt, 20 Apr 42; G-3 Opns Rpt, 27 Apr 42. Both in G-3 Jnl, GHQ SWPA. 53. JCS 9th Mtg, 6 Apr 42; Msg, Gen MacArthur to Gen Marshall, No. AG 460, CM-IN 6648, 25 Apr 42; Hist of U.S. Naval Admin in World War II, Comdr U.S. Naval Forces Southwest Pacific, pp. 7, 8, copy in the Office of Naval History. 54. Msgs, Gen MacArthur to Gen Marshall, No. AG 441, CM-IN 2601, 25 Apr 42, No. AG 506, CM-IN 7516, 28 Apr 12; The Koninklijke Paktevaart Maatschappij (K.P.M. Line) and the War in the Southwest Pacific Area, copy in the Office of Naval History. The K.P.M. ships, with Dutch masters and crews, were under charter to the British Ministry of Transport, which had allocated them to the U.S. Army. They were thus under direct control of USAFIA, rather than (as might be imagined) of Allied Naval Forces. 55. Prov Opns Rpt, Australian Army, 3 Apr 42; Allied Air Forces Opns Rpts, 10 Apr 42, 20 Apr 42; G-3 Opns Rpts No. 3, 11 Apr 42, No. 5, 12 Apr 42, No. 7, 15 Apr 42, No. 10, 17 Apr 42, No. 19, 27 Apr 42; Opns Rpt USAFIA, 20 Apr 42. All in G-3 Jnl, GHQ SWPA. 56. Allied Air Forces Opns Rpt, 10 Apr 42; G-3 Opns Rpt No. 35, 13 May 42. Both in G-3 Jnl, GHQ SWPA. OCE SWPA, Draft Engr Rpt, 1942; Hist Base Sec 2, Townsville, in AFPAC Engr File. 57. JCS 9th Mtg, 6 Apr 42; ANF Daily Opns Rpt, 16 May 42, in G-3 Jnl, GHQ SWPA. 58. Interv with Lt Gen Stephen J. Chamberlin, 14 Jan 50, in OCMH files; OCE SWPA, Draft Engr Rpt, 1942; Hist Base Sec 2, Townsville; Hunt, MacArthur and the War Against Japan, pp. 82, 84-85, 86. Unless otherwise indicated, all interviews were conducted by the author in Washington. 59. Memo, Maj Gen Richard K. Sutherland, CofS for CG USAFIA, 18 Apr 42, sub: Movement of Co E, 43d Engrs and the 96th Engr Br; (Cld), less two companies, and the attached Dump Truck Section of the 576th Engr Co; Memo, Gen Sutherland for CG USAFIA, 22 Apr 42, sub: Movement of One Separate Battalion Coast Artillery, Automatic Weapons; G-3 Opns Rpts No. 18, 26 Apr 42, No. 19, 27 Apr 42, No. 20, 28 Apr 42. All in G-3 Jnl, GHQ SWPA. OCE SWPA, Draft Engr Rpt, 1942. 60. NGF OI, No. 7, 23 Apr 42; Ltr, Gen MacArthur to Gen Blamey, 1 May 42; Ltr, Gen Blamey to Gen MacArthur, 2 May 42. All in 385, G-3 Files, GHQ SWPA. Memo, Gen MacArthur for Comdr ALF et al., 13 May 42, in G-3 Jnl, GHQ SWPA. 61. AAF, The AAF in Australia to the Summer of 1942, pp. 21, 23; Craven and Cate, The Army Air Forces in World War II, I, 425. The A-24's, the first U. S. planes to be based at Port Moresby, reached it in late March. The P-39's arrived in late April. 62. American-British Grand Strategy, ABC 4/CS1, 31 Dec 41, ARCADIA Proceedings, in ABC 337 ARCADIA (24 Dec 41). 63. JCS 6th Mtg, 16 Mar 42. 64. Msgs, Gen Marshall to Gen MacArthur, No. 739, 18 Mar 42, No. 1499, 26 Apr 42, in SWPA MacArthur File, OPD Exec File; Msgs, Gen MacArthur to Gen Marshall, No. AG 153, CM-IN 6430, 24 Apr 42, No. AG 470, CM-IN 6643, 25 Apr 42. 65. Ltr, Mr. Curtin to Gen MacArthur, 28 Apr 42, in 314.7, MacArthur File, Rec Sec Files, GHQ SWPA; Msg, Mr. Churchill to Mr. Roosevelt, No. 73, 29 Apr 42, in OPD Exec Off File Bk 10; Msg, Gen MacArthur to Gen Marshall, CM-IN 0667, 3 May 42. General MacArthur's quoted statements are from Mr. Curtin's letter to MacArthur, which is devoted principally to the text of a cablegram which Mr. Curtin sent that day to his Minister for External Affairs, Dr. H. V. Evatt, who was then in Washington, telling Evatt what MacArthur had said in the course of this meeting. 66. Msg, Mr. Churchill to Mr. Roosevelt, No. 73, 29 Apr 42. 67. Msg, Gen Marshall to Gen MacArthur, No. 8, CM-OUT 6034, 30 Apr 42; Msg, Gen MacArthur to Gen Marshall, No. AG 588, CM-IN 0186, 1 May 42. 68. Msg, Gen MacArthur to Gen Marshall, No. 151, CM-IN 0667, 3 May 42. 69. The matter is fully discussed in Gordon Harrison, Cross-Channel Attack (Washington, 1951), a volume in this series. 70. Memo, Gen Marshall for the President, 6 May 42, sub: The Pacific Theater versus BOLERO, in JCS 48, ABC 381, Pacific Bases (1-22-42), Sec 2; Memo, President Roosevelt for Gen Marshall, 6 May 42, in SWPA-MacArthur File, OPD Exec File. 71. Msg, Gen Marshall to Gen MacArthur, No. 31, CM-OUT 1131, 6 May 42. 72. Msg, Gen MacArthur to Gen Marshall No. 176, CM-IN 2333, 8 May 42. 73. Ltr, Mr. Curtin to Gen MacArthur, 8 May 42, in 314.7, MacArthur File, Rec Sec Files, GHQ SWPA. This letter contains the full text of Mr. Curtin's cable to Dr. Evatt. The material quoted above is to be found in that cable. 74. Ltr, Mr. Curtin to Gen MacArthur, 4 May 42, in 314.7, MacArthur File, Rec Sec Files, GHQ SWPA. 75. Ltr, Mr. Curtin to Gen MacArthur, 8 May 42, in 314.7, MacArthur File, Rec Sec Files, GHQ SWPA. 76. Ltr, Gen MacArthur to Mr. Curtin, 12 May 42, in 314.7, MacArthur File, Rec Sec Files, GHQ SWPA. 77. Ltr, Mr. Curtin to Gen MacArthur, 16 May 42, in 314.7, MacArthur File, Rec Sec Files, GHQ SWPA. 78. Ltr, Gen Marshall to Field Marshal Sir John Dill, 18 May 42, in OPD Exec Off File, Bk 5. 79. Ltr, Gen Marshall to Field Marshal Dill, 22 May 42, in OPD Exec Off File, Bk 5. 80. The President's message in paraphrase is in Ltr, Mr. Curtin to Gen MacArthur, 23 May 42, in 314.7, MacArthur File, Rec Sec Files, GHQ SWPA.